Last week was my daughters 4th Birthday party, I can’t believe how the past few years have flown by! Today I wanted to share a few details from her party. This wee one usually isn’t the simple type but this year her instructions were clear that she wanted her friends to play in the playhouse, swim in the pool, eat yummy treats and make crafts- Easy enough! We had some pretty tasty treats. 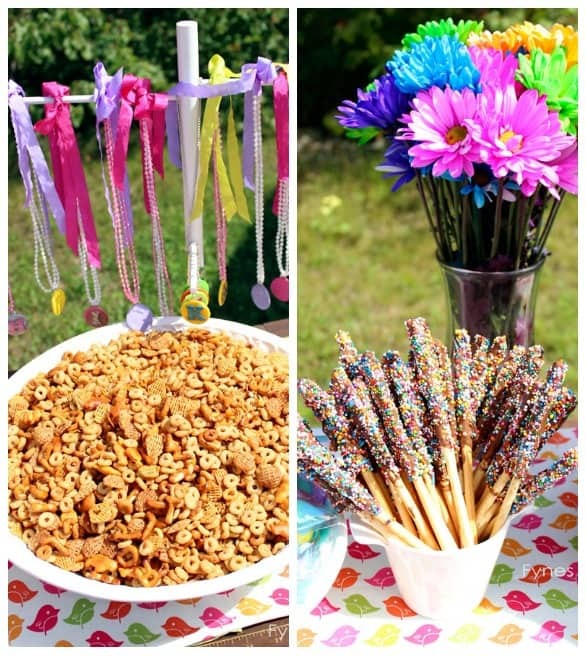 Homemade sweet and salty bits and bites, candy kabobs, chocolate sprinkle sticks, peanut butter butterscotch squares, freezies, and chips. All the children went home with a personalized necklace (for the girls) or keychain (for the boys) party gift. She did have a real cake but this party favour cake filled with kettle corn and fruity marshmallows was too yummy not to share. Unfortunately the real cake missed the photo shoot! 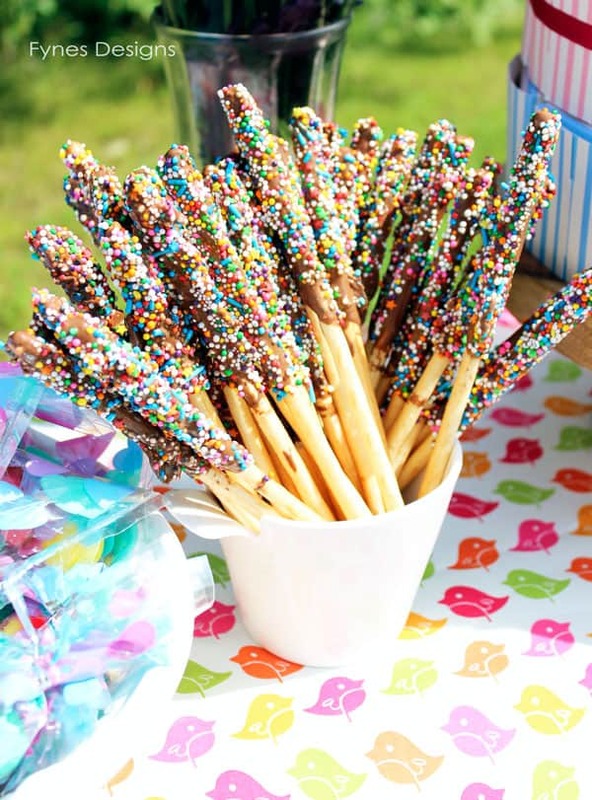 The Chocolate sprinkle sticks were the biggest hit of the party, plus she helped make them… not ideal for a hot day, but the kids had no problem getting them out of the heat! These were the little craft the kids made to take home. I acquired these vinegar bottles from an auction. 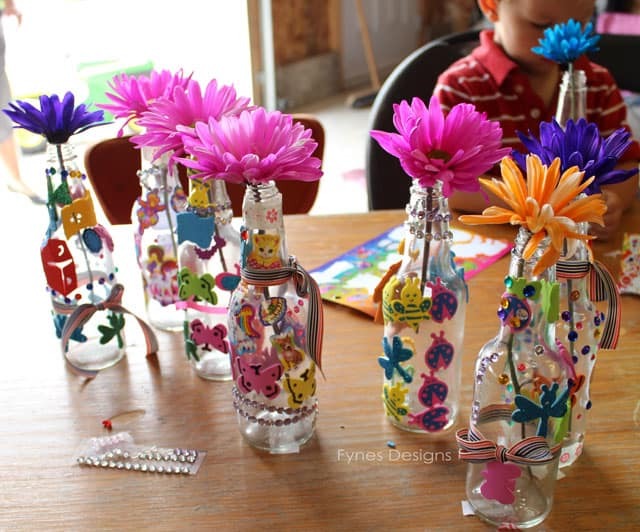 A few foam stickers, rhinestones, and ribbon made them beautiful vases. The birthday party decorations weren’t too fussy. 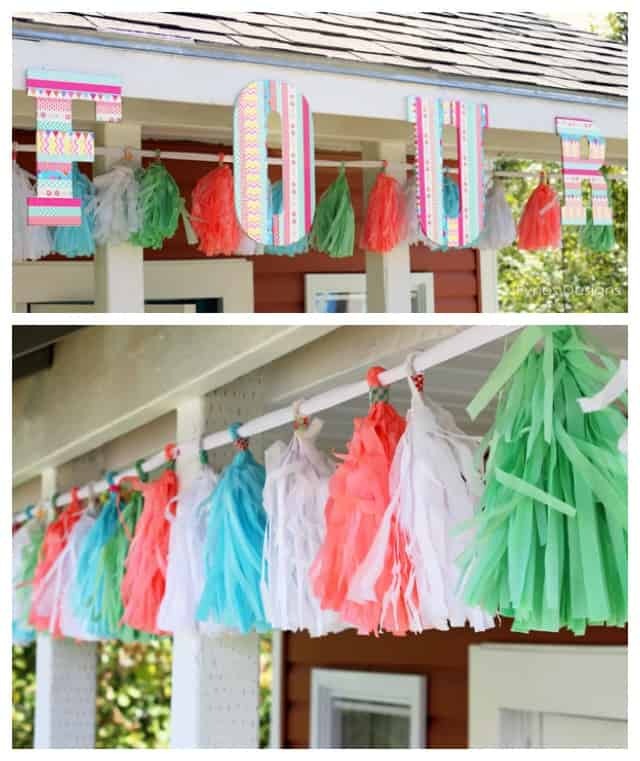 I created this tissue paper garland that I absolutely loved, especially the color combo! I picked up the large letters from the clearance bin a Michaels and added a washi tape for a unique look. We lucked out with a beautiful sunny day for the birthday party, the kids had a blast playing in the new Playhouse, and splashing around in the pool. 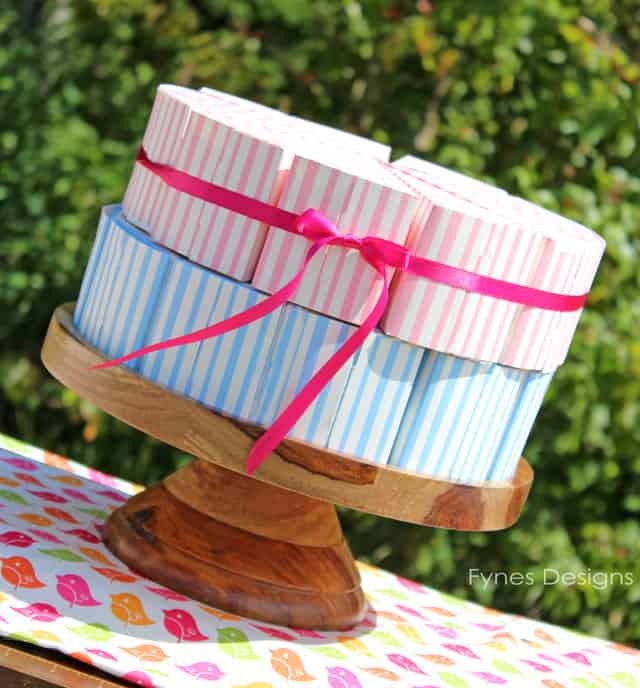 For some fabulous birthday party inspiration check out Anders Ruff one of my favourite party design sites. 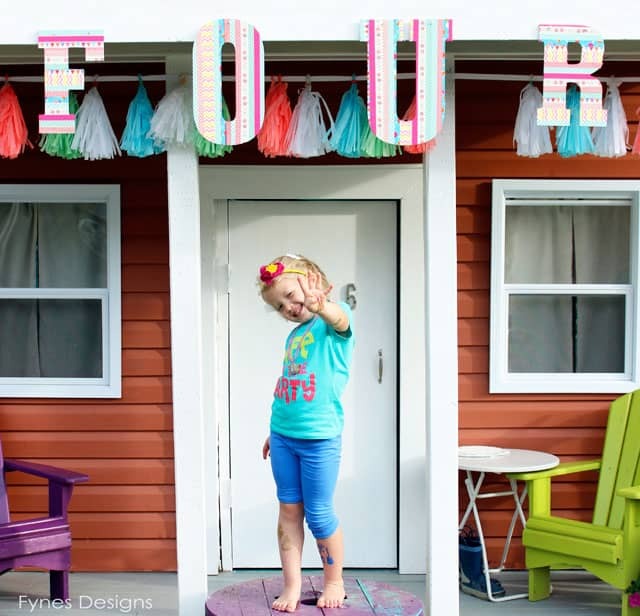 Check out her 5th birthday party here. 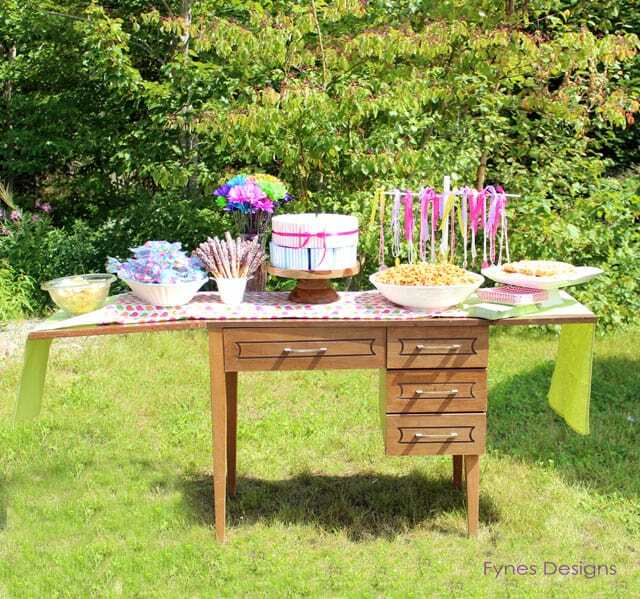 Follow Virginia | Fynes Designs’s board Kids Parties on Pinterest. For sure Claudine, you can stay in the playhouse! What a fun birthday party! I love all the details, especially the tissue paper garlands. Pinning this! thanks, I think the paper garlands were my favourite too!